Every time Ohio State made a rally it wasn't a pick-on-Player-X type of thing; it was a handful of team defensive breakdowns. 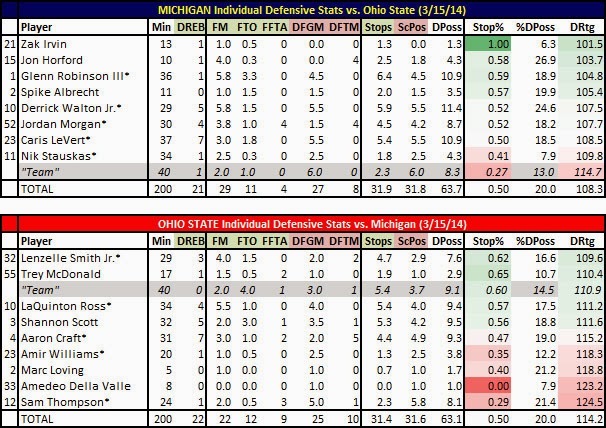 That shows in Michigan's individual defensive ratings as no one was spectacular and no one was awful. When another team's guards are hitting 3-pointers - like Shannon Scott did on Saturday - Michigan's guards are going to take the score sheet blame (as they should). It's crazy to think that Scott hit four triples on Saturday, the same number he had made in the previous nine games combined. Maybe it was a bad scouting report that said, "sag off Scott when he catches the ball outside the 3-point line" that Nik Stauskas and Caris LeVert can blame? Jumpin' Sam Thompson really isn't good for much except high-flying dunks and sporadic defense that touches the greatness level. He's a nice player, but defensively his in-your-face routine works to a point but he gets beat a lot and loses his man around screens. By my count Thompson was responsible for four of Michigan's triples - three by Stauskas and another by LeVert.